This is the truest example of a “Highly Exceptional Article” on our blog. In this case, we didn’t need any article published in the world meda nor any excuse to discuss one of the most serious issues we Basques are currently facing. We’re referring to the attacks on our financial and tax system. The attack on the Economic Agreement in a campaign launched in Spain to demand an increase to what the Basques contribute to the “common fund” are neither innocent nor just. Their goal is that same as that of all the attacks Basque self-government has received in its history: making us disappear as a people. That’s why we’re writing this entry. We know it’s long. But we also believe that the importance of the subject and the gravity of the attack demand a clear reflection and position. We’ve been accepting small cuts here and there, and we find that the few freedoms we Basques have left are being almost imperceptibly limited. Not showing a clear reaction to this could end up meaning our disappearance. And we don’t think we’re exaggerating. For those citizens who live in the “Common Régime” territory, that is, not in territories governed by a fuero, it might be hard to understand (at least when based on the overall view in those territories of what exactly Spain is) why the citizens of Alava, Biscay, Guipuzcoa, and Navarre do not share the same fiscal laws or tax administration as the rest of Spain. In other words, they’re surprised that the Basques pay their taxes to an agency that isn’t the Agencia Tributaria, the national-level tax agency. They’re very surprised that fiscal law is dictated by parliaments different to their own. But they’re most surprised that the budgets of these Southern Basque Country territories’ governments does not depend on any other governmental body or financial fund than that of the Basques themselves. This can lead to the very Spanish line of thought that if this is so, it’s because it benefits them. Their reasoning is based on the idea that no one would want to risk depending on themselves unless it’s because there’s a financial benefit. And of course, if the Basques benefit from that system, it must be because others lose something; most Spaniards believing that the “others” are the rest of Spain. The obvious conclusion then is that they stop receiving money from the rest of Spain, money that allows them to be “over-financed”, and that they should start putting their money in the “common fund”, so that it goes to those who really deserve it, meaning “Spaniards”. Because “it’s high time we stopped giving them money”. They don’t realize that this line of thought could also be applied to France, Germany, Austria, or Denmark. Because when it comes to taxes and finances, the Navarrese Tax Agency, for example, is almost the same as the German tax agency (if not exactly the same) as far as the Kingdom of Spain is concerned. It might seem hard for the Spanish to admit, but their complaint with regards to the differences between the “Common Régime” and the Foral territories is similar to that hypothetical complaint to the different economic situation between Spain and any other European country. We should also look at it in the other driection. Why do some city governments have more resources than others? Isn’t this also unfair, showing a lack of solidarity? They should also set up a common fund and then redistribute it among all. The Constitution protects and respects the historical rights of the ‘foral’ territories. General changes to that ‘foral’ system will be made under the provisions of the Constitution and the Statutes of Autonomy. This is the First Additional Section to the current Spanish Constitution, and is, for the Basques, the most important element therein. What it means is that we Basques south of the Pyrenees have a series of rights that precede the Constitution itself, and which are protected by the same. Our foral system is our authentic constitutional structure. It’s our own, sovereign political structure, which was stolen from us at gunpoint during the Carlist wars and which, 100 years after the last of them ended, found certain refuge in the current Constitution. It’s not the refuge we sought or which we really ought to have, but it does help us continue existing as a people. Our historical rights as Basques are those the members of our nation decided on and exercised for centuries as they best saw fit. They are neither privileges nor concessions. They are rights. They are the rights our forefathers gave themselves through the centuries, creating a unique and extraordinary corpus of law that was able to withstand everything except the ferocious centralism of some liberals blinded by the lust for power. Our historical rights are numerous, and go from not having to fulfill any military service obligation to deciding whether or not we have customs at our borders. Of all of them, one of the most important is undoubtedly that of having our own tax system and tax agencies. In other words, Basques south of the Pyrenees pay our taxes to our government, depending on our own tax law, and with those resources (that came from us), we determine what our priorities for expenses and investment should be. That’s how it’s always been, and that’s how it should always be. It’s important to clearly understand what characteristics define the Economic Agreement (concierto) for the Autonomous Community of the Basque Country (ACBC), and the Economic Agreement (convenio) for the Foral Community of Navarre (FCN). It is agreed upon. The basic decisions are made in commissions that are made up in equal parts of representatives from the ACBC (concierto) or the FCN (convenio) and Spain. The results of the negotiations are approved in laws, which cannot be modified by the Spanish Parliament after they’re agreed on. That is to say, they get the same treatment as an international treaty. It is a historical system. The Navarrese Convenio was first approved in 1877, and the Concierto in 1878, as a way of integrating the Basque territories into the Spanish economic system. It’s constitutional. The First Additional Section of the 1978 Spanish Constitution states that the Constitution protects and supports the historical rights of foral territories, with the Concierto being the most genuine display of those historical rights. It practices solidarity. The ACBC and FCN Agreements ensure that the Southern Basques contribute to the common expenses in proportion to their wealth. Also, they contribute to financing the Interterritorial Compensation Fund, which is the instrument established by the Spanish Constitution to reduce the differences between the different autonomous communities. It is a system of responsibility, or unilateral risk. The Basques of the ACBC and FCN must contribute to the common expenses regardless of their own financial situation, since the amounts they contribute (the Contribution Quota) is only calculated on variables that depend on the exclusive will of the Spanish government. Also, the contribution of these resources does not ever guarantee that any of those resources will be re-invested or spent in those Basque territories. The Quota: Is There Solidarity? The Quota (cupo in the ACBC, aportación in Navarre) is the amount that must be paid to Spain to finance the powers that have not been assumed by the Basque governments effectively. Does contributing this way mean we have no solidarity? So, why do we have more resources? Basically, because the effective fiscal pressure is greater. The foral tax agencies are just better at collecting taxes. This is due both to a greater commitment to the system on the part of the taxpayers and to a more efficient system of collection and control. We could speak of a lack of solidarity in other areas. For example: between 2000-2006, the Autonomous Community of Andalusia received more than €11,951 million from the European Structural Funds. In that same period, the ACBC received just under €995 million. No comments. If Spaniards want the Basques to pay more, the solution is easy: they need to pay more. If the black market economy, fraud, and tax agency efficiency were all improved, they’d collect more in taxes, which would increase the Spanish Central Government’s budgets and, therefore, the amount Basques would also have to pay. But, of course, the politicians who launch these attacks don’t find that funny. They just want others to pay so that they can spend. This is the key to everything that’s been happening these days. In Spain, there’s a resistance to being Una, Grande y Libre (one, grand, and free). There’s a resistance to everyone not being equal, forgetting that the principle of equality before the Law is none other than treat equals and equals and unequals and unequals. And we Basque are different to the other subjects of the Kingdom of Spain; we are now and we always have been. This is particularly bothersome. Curiously, this dissatisfaction doesn’t turn into an attempt to get the same, but rather that everyone else, that is, the Basques, stop having it. Maybe it’s because they don’t like how the Basques are “mature”, while they’re still receiving “pocket money” from the “mommy state”. But they don’t want to take the risk, or accept the responsibilities; they just want it so that no one else makes them look ridiculous in their incapacity. That’s why there’s now a campaign aimed at drowning out our finances. Since they can’t eliminate the Agreements without “touching” the Constitution, the solution they’ve thought of is to raise the Quota, to make us pay so much that our system becomes untenable. That way, they think, we’ll cede and fully join, finally, the “general agreement of the Spanish State”, and thus our historical rights would cease to exist. While it is true that this is something they’d like to get in any case, it is even more so because the success or our system makes that project seem even more absolute to them. One cannot underestimate the weight in this campaign of the envy of success of the foral system. We get the impression that they hoped this economic crisis would weaken us to the point of making the system untenable, just as we’re sure that when they gave into our demands to recover the Economic Agreements, they were convinced that we weren’t going to be able to dig ourselves out of the hole Francoism had dug for us; they were sure this “self-governed financing” was going to die of starvation. The main problem we Southern Basques have regarding this fiscal system that establishes and regulates the fiscal and tax systems between the foral territories and the Spanish State is that almost no one knows what it is, what it’s based on, and how it works. And it’s quite a problem if the Spanish people, journalists, politicians, and talk-show hosts don’t understand it, because their lack of knowledge about it could prevent them from understanding that ending the Agreement system would be tantamount to ending the last ties Southern Basques have with the Kingdom of Spain. For almost two centuries, they have been methodically destroying all the bridges Southern Basques made when they allied themselves with the Spanish Crown; there’s nothing else left. It may be that their lengthy and sustained efforts finally completely isolate us from the political reality that they call Spain. That’s something that many (if not most) of us Basques would be grateful for. But the real problem is that Basques don’t understand it, either. Now, we don’t want to make any assumption about what our politicians may or may not understand, although statements by some of them do give one pause. However, it’s obvious that many Basque journalists and talk-show hosts would do good to go to a training course on the Agreement, although we get the impression those are few and far between. The biggest problem comes from this lack of knowledge on this essential subject in society at large. It’s very hard to defend what you don’t understand, and it’s very hard to give the proper importance to something that you don’t know. Basque institutions should launch a permanent campaign explaining what the Agreements are and how important they are. Basque citizens need to have some basic knowledge, starting at school, of their importance. We should also offer all journalists, wherever they’re from, the opportunity to learn about what they are so that they can understand them and properly explain them and report on them. We have no doubt that work is already being done on this front. But, with all due respect to the flu and its dangers, the knowledge about these matters is infinitely more important than the annual flu vaccine campaign. We’d be happy if just half the resources used to tell people of a certain age to get vaccinated were also spent on spreading knowledge about the Agreements. Fortunately, even if this means that not enough is being done, there are the sources of information offered to us by the Ad Concordiam Association for the Promotion and Diffusion of the Economic Agreement, which is a private non-profit entity whose members are the Biscay Government, the University of the Basque Country, and the University of Deusto. These sources should be shared. Among their activities, we can find a website where we can learn all about the Concierto and its significance. This information is great for getting a general understanding of the Convenio, as well. It can be read in Basque, English, and Spanish. We hereby invite all Basque institutions to coordinate to spread the knowledge of these tools of our self-government and sovereignty. It’s something all the citizens of this country should understand. After writing up this reflection, the Agreement Community (Comunidad del Concierto) was created by a group of citizens who are worried about the weak situation the lack of knowledge leaves the Agreements in. The Economic Agreement is the financing system of the Basque Country, by virtue of which the financial and tax relations between the Basque Country and the Spanish state are set up. The 1978 Spanish Constitution, nowadays in force, safeguards the Economic Agreement as part of the core of the foral historical rights of Álava, Bizkaia and Gipuzkoa and lays down its general updating within the framework of the Constitution and of the Statute of Autonomy of the Basque Autonomous Community. 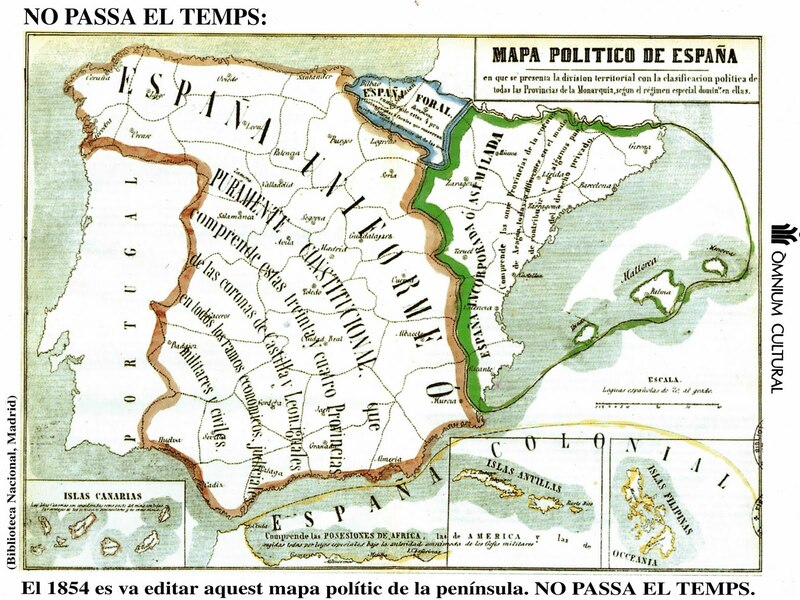 Political map of Spain in 1854, which shows the territorial division with the political classification of all the provinces of the Monarchy according to the fiscal system in practice in each.